Many times I feel the need of Infinite loops for testing purposes, to catch an occurrence of an event or while stress testing applications, service or some specific processes. DEFINITION : An infinite loop (also known as an endless loop or unproductive loop) is a sequence of instructions in a computer program which loops endlessly, either due to the loop having no terminating condition, having one that can never be met, or one that causes the loop to start over. I personally think Infinite loops can be great utility for System Admins, and could be utilized for temporary monitoring of running applications, specific services and process under stress conditions. Leaving the conditions empty makes its conditional check TRUE on every iteration and loop runs infinitely. While loops are Entry controlled loops, and body is executed if condition is TRUE on the top. Do While is an Exit controlled loop where body is excuted first then condition is checked at the bottom and will iterate if Bottom condition is TRUE. Initially, I thought it was a great idea like in other programming languages, but Recursion has some limitations in powershell and it will not run endlessly due to depth overflow, to know about depth overflow refer THIS article, but we could use recursion where we have to make lesser number of iterations. I’m want to stress test an running process on my machine , under defined criteria and break the loop when the threshold is breached. I could achieve it in the following manner. it will give the output somewhat like this. 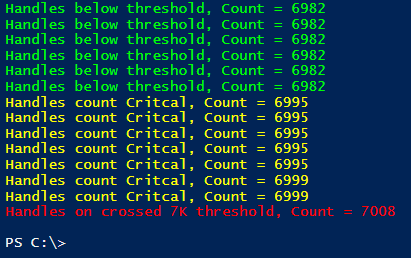 Suppose I’m going to schedule SQL backup to run 9 PM everyday on a machine but before that I want to test if the memory or CPU utilization when the backup is running, crosses the defined threshold. Happy Reading Folks ! 🙂 Have a nice day ahead.